Cooking - Ground Corn is mixed with pure limestone water and cooked at a high temperature. The temperature is lowered and ground rye is added and further cooking takes place. Mashing - After the corn/rye mixture has cooked, the temperature is lowered again for the addition of barley malt. This begins the mashing process. Barley is malted by moistening the grains until they sprout. Malting releases an enzyme that converts grain starch into sugars. When the conversion is complete, the mash is transferred to fermenters. Fermentation - Yeast is added to the mash to begin the fermentation process. Each strain of yeast imparts a distinctive flavour and aroma to the finished Whiskey and each distiller has a preferred strain. Distillation - When fermentation is complete ie. when the sugars have been converted to alcohol, the mash, called “distillers beer” is pumped into the still. Inside, mash entering from the top meets steam rising from the bottom. The steam vaporises the alcohol in the mash and carries it out the top of the column into pipes where it is cooled and condensed back into a liquid. The product of the first distillation is called “low wine”, which is then distilled a second time. 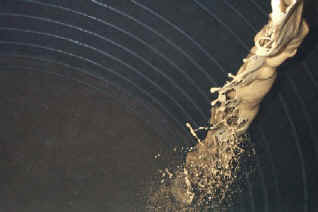 The product of that distillation is traditionally called the “high wine” or “white dog”. Ageing - New Whiskey is as clear as water. Bourbon’s distinctive colour and much of its flavour comes from long aging in wood. The longer bourbon is aged, the more flavour it takes from the wood. 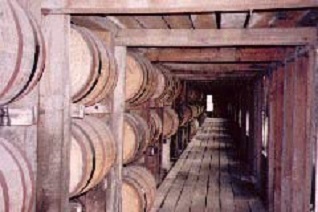 By law, Bourbon must always be aged in new charred white oak barrels. Charring caramelises sugars in the wood, which slowly dissolves into the resting Whiskey.